I am sure by now that most people are aware that there are ever-increasing levels of carbon dioxide in the atmosphere. The current estimate is that there are 400 parts per million of carbon dioxide in the atmosphere. This is the highest level that has ever been recorded. Carbon dioxide is a greenhouse gas and these excessive levels in the atmosphere are one of the major contributing factors to climate change. Although agriculture, forestry and other land use contributes 24% of the global greenhouse gas emissions, agriculture is also one of the most prominent possibilities to remove carbon dioxide from the atmosphere. This possibility is through the storage of carbon in the soil. 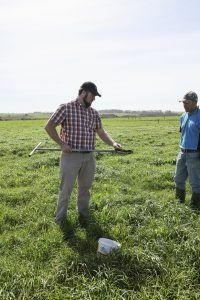 Farmers that implement sustainable land-management practices can improve the carbon levels of their soils, thereby moving carbon from the atmosphere through plants into the soil. One of the farms which have been participating in the Woodlands Dairy Sustainability Project since its inception five years ago has done a great job of this. When Trace & Save sampled and analysed their soil on their irrigated areas in 2013, the average carbon levels were 3.4%. The area was sampled again in 2016 and the levels had increased to 3.6%. 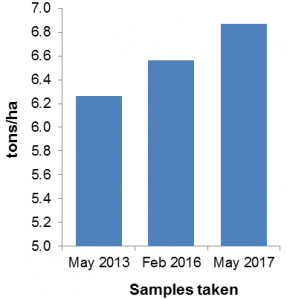 Most recently samples were taken in May 2017 and the soil carbon levels are now 3.7%. This may not seem like much of an increase, but when we calculate the total of amount of soil carbon that is in the top 15cm of the soil (the depth which the samples are taken at), it is an increase of 0.6 tons per hectare of land. There are 350 hectares of irrigated pasture on this farm. That means that over the four years between when the samples have been taken, an additional 210 tons of carbon have been stored in the soil. That is the equivalent of the greenhouse gas emissions from 163 passenger vehicles driven for one year1. This is just one farm, and only taking into account the very top part of the soil, but it shows the potential that farms have to contribute positively to the challenges associated with climate change. This kind of change is reliant on farmers implementing practices that facilitate the build-up of carbon in the soil. The story could just as easily be the opposite, as in a decrease in soil carbon levels, if bad management practices had been implemented. It is important that consumers not paint farmers with the same brush. Yes, agriculture has associated negative environmental impacts, but there are some farmers that are actually also making a positive environmental contribution through their practices. United States Environmental Protection Agency Greenhouse Gas Equivalencies Calculator (https://www.epa.gov/energy/greenhouse-gas-equivalencies-calculator – Accessed 26 June 2017).